The first ever “biochar” from common reeds field day held at Mypolonga, October 16, 2013. Presentations were made by joint partners Wayne Brown (Principal Environmental Consultant from Environments by Design), Greg Butler (R & D Manager from The South Australian No Till Farmers Association) and Russell Seaman (Program Leader, Partnerships & Landscapes from the Department of Environment Water and Natural Resources). 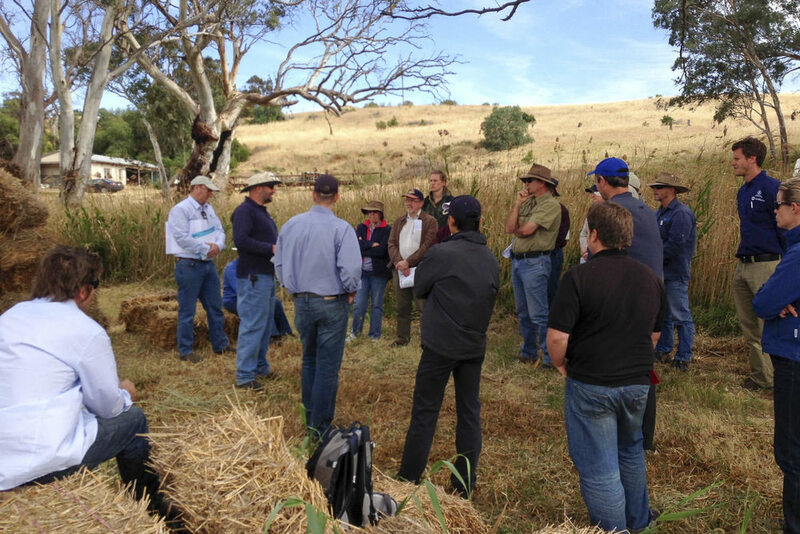 Over 30 property owners and landscape managers from as far afield as Hindmarsh Island, the Adelaide Hills and Clare attended the first ever “biochar” from common reeds field day held at Mypolonga this week. The field day was held at Rod Baker’s property on Wednesday 16th October. It was sponsored by the Australian Government’s Department of Agriculture Food and Fisheries (DAFF). “Over the past 25 years I have been asked what other commercial options are available for the River Murray swamps? It was not until the three partners got together that we realised an opportunity. The use of common reed for biochar production or other products may provide an opportunity for those landowners who still own River Murray swamplands to be part of a much larger industry development program,” he said. The field day recipients were provided with information explaining the growth characteristics of common reed, possible yields, environmental benefits of using the species and possible commercial applications. From the reed bed trial site guests were then shown a simple process of making biochar and commercial developments in larger biochar machines. The group was also shown commercially available products made from biochar combined with other agricultural or horticultural waste products such as chicken litter or olive pips. The group then travelled to Palmer to see the practical use of the end product, reed biochar, in a cropping situation. Mr Brown said, ‘Although the current trial crops had not yet been harvested, 5 years of independent research conducted with partner organisation SANTFA shows that using different rates of biochar in cereal cropping improves crop yields whilst reducing fertiliser applications. Once we complete the research, we will know how the reed biochar has performed; however, like all new ideas, this is a significant local opportunity and the use of biochar in agriculture is looking positive. The 2 year research project sponsored by the Australian Government Department of Agriculture Food and Fisheries runs until the end of June 2014.